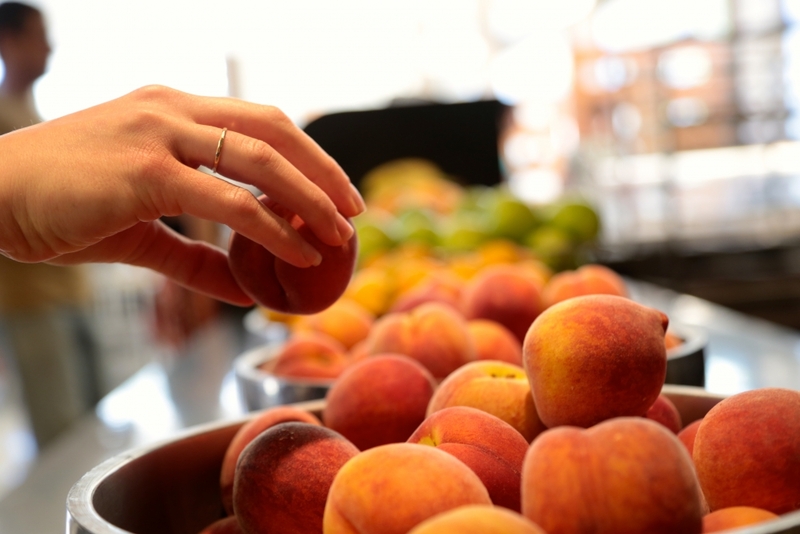 Locally grown peaches are served in the dining commons at UCSB. 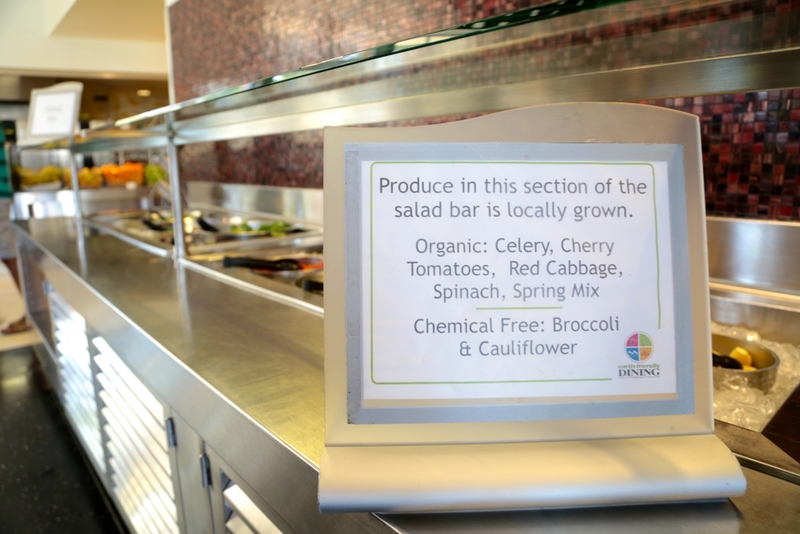 Locally grown and chemical-free produce are labeled at the salad bar in De La Guerra dining commons. A UC-wide sustainability initiative set a 20 percent goal for locally grown produce in 2020. 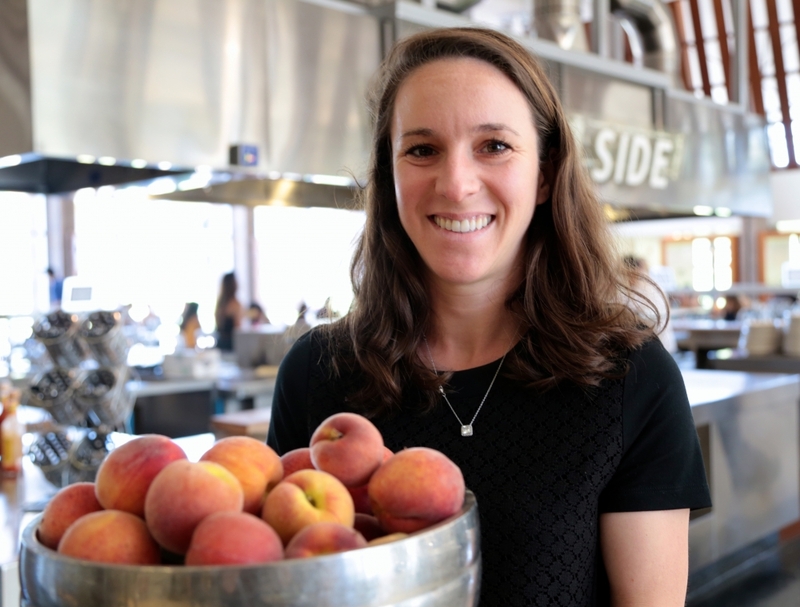 Danielle Kemp, residential dining services’ dietitian, holds a bowl of locally grown peaches. As the largest purchaser of wholesale produce in Santa Barbara County, UC Santa Barbara’s residential dining services provided the perfect avenue for a pilot project incorporating local pesticide-free or certified organic produce into an institutional setting. The idea was conceived almost 10 years ago, when a group of students approached environmental studies professor David Cleveland about becoming a faculty adviser for student-led sustainable living classes. The group wanted to explore how to bring more local organic food in the dining halls. In 2010 Cleveland and a group of student researchers began documenting the process, which led to the publication of a paper in the Journal of Rural Studies. A confluence of factors helped to support the project, including a UC-wide initiative to purchase local produce. At the same time, Santa Barbara County farmers were in need of an alternative local food hub to wholesale their produce to local institutional users. Farmer Direct Produce (FDP) — now Harvest Santa Barbara — filled that gap by serving as the wholesale link between farmers and UCSB and other outlets. Residential dining services at UCSB provide about 10,000 meals a day — 2.5 million meals a year — so the task could have been daunting. Instead, the organizers started small, adding five or six local and organic items to the salad bar. Scaling up slowly turned out to be key to the project’s success. While local food systems have increased in popularity in recent years, the majority of the food system is still dominated by large-scale national and global networks. “The entire food system is oriented toward large players and oriented to maximize their profit, not maximize environmental benefit or social benefit or nutritional benefit or community benefit,” Cleveland said. The challenge for FDP and UCSB was to create a viable operation for all parties involved, which meant moving beyond the profit-dominated mentality of the mainstream food system. Personal relationships built on trust turned out to be important elements. FDP’s Wesley Sleight and Anna Breaux knew the farmers whose crops they purchased; the pair also developed a good working relationship with Terry Thomas, systems analyst with residential dining services, and Bonnie Crouse, assistant director of residential services, both now retired from UCSB. There was commitment on both sides to reach the same goal: scaling up the amount of locally grown pesticide-free or organic produce used in UCSB dining halls. Initially, students had minor concerns because the organic produce often didn’t look the same as its conventional counterparts in grocery stores. Education was key. The concerns diminished once the students began to understand the benefits of choosing seasonal, locally grown produce. Dining hall chefs also had to be educated so they would embrace ordering from FDP and understand the worth of the extra effort involved in using local produce. Despite these learning curves, by 2010 — five years into the project — UCSB was buying 100,000 pounds of produce from FDP. In 2012, FDP was sold and renamed Harvest Santa Barbara. UC Santa Barbara's The Green Initiative Fund (TGIF) Grant Making Committee has announced its grant recipients for the 2011-12 funding cycle.